Baths not only relax your baby, but they can also give you a break to bond and play after a hectic day. And like baby massage, a warm bath can be an excellent way to help prepare your baby for bed. Water as a cleanser doesn't remove the fat-soluble impurities left behind under diapers and clothes, and if they remain, they can cause the delicate skin barrier* to break down. And water alone can actually dry your baby’s skin. Repeated use of water only, especially when hard or chlorinated, has been shown to cause moisture loss from the skin cells, leaving baby skin irritated or red. A gentle baby-specific cleanser like JOHNSON'S® baby TOP-TO-TOE™ wash is recommended to help cleanse effectively while still protecting the natural moisture of baby skin. Most midwives and other health care professionals recommend bathing newborn babies 2 or 3 times per week, increasing the frequency as your baby gets older. Even though you may not give your baby a bath every day, swaddle bathing your baby is an alternative many moms choose for their very young babies. Though it might seem scary at first, bathing your newborn baby is another chance to bond with her and make her feel safer and calmer. The kitchen sink can be a great place for bathing baby (with the tap turned away and soft towels or a foam insert on the bottom) or you could use a small plastic baby bath placed in the full size bath to make it easier to hold your baby. Start with only a few inches of warm water. Baby’s bath water should be between 32 to 37 degrees Celsius. After filling the basin or tub, be sure to swirl the water with your hands so there are no hot spots. Before you put your baby in the bath water, test the water’s temperature on the inside of your wrist to make sure it is not too hot. NOTE: Be sure that your home’s hot water heater is set no higher than 37 degrees Celsius to help protect against accidental scalding. To help excite baby’s senses during bath time, gently rub JOHNSON’S® baby oil onto her skin. JOHNSON’S® baby oil acts like a warm protective barrier on baby’s skin. If your baby has more hair, you might try a gentle shampoo, like JOHNSON'S® baby soft & shiny shampoo, which leaves hair beautifully soft, smooth, and shiny. Don’t be afraid to gently wash the soft spots (called fontanels) on your baby's head. Clean the rest of the body. Gently cleanse around your baby's eyes with a cotton pad dampened with clean, warm water. Use a new cotton pad for each eye and always wipe from the inside corner of the eye outward. Then, using a soft washcloth, wipe around your baby's mouth, nose and whole face, working from the middle outward. Wipe the creases in her neck and don't forget behind her ears! For younger babies, wet a baby washcloth with warm water and use a gentle cleanser formulated for babies, like JOHNSON'S® baby milk bath, which has vitamins and minerals that strengthen the skin two times better. Dry your baby well in all the creases, as excessive moisture could lead to skin irritation. Pat skin to avoid skin damage. Before dressing her, apply a gentle baby moisturizer such as hypoallergenic JOHNSON'S® baby milk bath, then smoothen skin with baby powder like JOHNSON’S® baby powder. Both are clinically proven to be gentle and mild. And remember, NEVER leave a baby alone in the bath. Not even for a second. A baby bath is a perfect way to create separation between "busy time" and "sleep time",while giving you the chance to bond with your baby. Even tough days can feel a little easier when you end the night by wrapping your beautiful clean baby, snug and cozy, in her blanket — just in time for a lullaby. *The skin barrier is the upper layer of the skin that acts as a vital barrier to outside irritants, bacteria and allergens, protecting the body from disease. Babies' skin barrier is uniquely and still developing, so it needs special care. 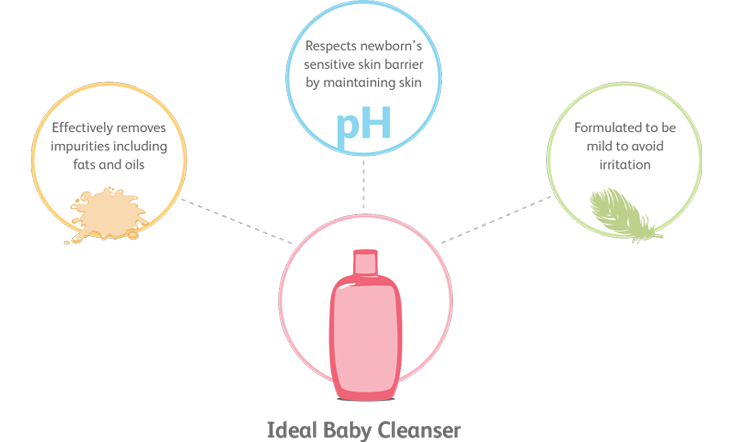 Learn how to keep baby’s delicate skin healthy and moisturized. Introduced in 1953, JOHNSON'S® baby shampoo was the first specially formulated product to be as mild to a baby's eyes as pure water. Our unique JOHNSON'S® baby shampoo and other NO MORE TEARS® formula products were developed just for babies’ unique needs.